This versatile set of three stacking rings is perfect for everyday wear or as an eternity ring. Palladium, 9 carat rose gold and 9 carat yellow gold have been chosen to maximise the contrast between the metal of each ring. The trio of rings holds 24 brilliant cut diamonds (0.12ct) in total which have been invisibly set and randomly scattered across the design. 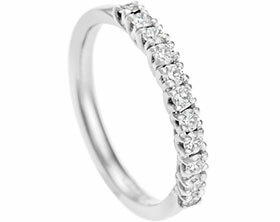 Different coloured diamonds have been set into each ring, all chosen to complement the colour of the individual metals. The palladium has crisp white G-H VS diamonds, the 9 carat yellow gold has beautiful natural champagne diamonds and the 9 carat rose gold holds natural mink coloured diamonds. Each ring has been given a hammered and polished finish for a contemporary feel which further highlights the brilliance of the scattered diamonds. Size L (approx US size 6).